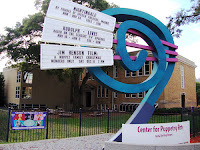 The Center for Puppetry Arts, in Midtown, Atlanta, is the largest non-profit organization dedicated to the art of puppetry in the United States and one of the most surprisingly amazing hidden gems in the city. Rather, I should write hidden "Jim's" in the city…as in Jim Henson, the 20th Century puppetry pioneer and father of the Muppets. Kermit the Frog and Jim Henson (Kermit's creator) cut the ceremonial ribbon opening the doors of the Center for Puppetry Arts in September 1978. Henson returned 10 years later to perform, with a Muppets ensemble, two shows of "The Muppets Take Atlanta." I so wish I had seen that show! Only one year before, in 1987, I had driven by the Center for Puppetry Arts for the first time. I'd since wondered "what's inside?" I knew from the obvious size of the buildings that there must be a lot going on inside, but I never heard anything about it. It wasn't until today, in November 2010 and countless pass-bys since, that I realized that the Center is quite a major production. Inside, the Center is home to a massive museum featuring thousands of puppetry artifacts, including puppets of all sizes, props, sketches, videos and a lot more, which is a mere percentage of the Center's permanent collection. The Center also has performance spaces, educational facilities and a gift shop. Growing up with an always-makes-me-smile fondness for the Muppets (The Muppet Show), I want to begin my recanting of this visit—this discovery—with the Jim Henson exhibits. While I indulged in a guided tour, keep in mind that a visitor who is on a self-guided tour may visit the museum's exhibits in any order they like and stay until closing if desired. The first Henson character a visitor sees is Big Bird…a more than eight-foot tall "canary" from the globally popular children's show Sesame Street. Amazingly, Caroll Spinney has played Big Bird since 1969, as well as Oscar the Grouch. It's been said that he's quoted as having had the pleasure of playing the "Yin and the Yang" of Sesame Street. The next Muppet in sight, arguably the most famous of them all, is Kermit the Frog. Kermit is featured in the "A Man & His Frog" exhibit, located immediately outside the more extensive "Jim Henson: Puppeteer" exhibit. Puppeteer features Rowlf the Dog, a piano-playing canine and the first internationally recognized Muppet. After a year of starring in Purina Dog Chow commercials, Rowlf became the sidekick, from 1963 to 1969, on The Jimmy Dean Show. Rowlf was performed by Frank Oz who would later serve as the puppeteer behind Jedi Master Yoda in Star Wars, a jewel in the crown that is his career. The Rowlf Muppet is displayed presenting a rose to Lassie, that he reportedly "had a crush on" throughout The Jimmy Dean Show. One of my favorite Muppet characters (admittedly, I have several) is the Swedish Chef, the only Muppet to ever feature real human hands. He's on display mixing up a dish that I'm sure would have ended up strewn across half the exhibit floor were it not for the plexiglass. My tour guide told me that Henson liked the Swedish accent, thus the character's dialect. I'm not sure which is worse, his accent or culinary skill, but both induce a smile, and likely a hearty laugh, quicker than you can pop a kernel of corn. The Puppeteer exhibit has many other characters, including a hand puppet version of the larger than life La Choy Dragon who was seen only in commercials. I don't remember seeing the La Choy Dragon commercials, but evidently my mother did see them because I do remember La Choy always being in the cupboard. Other exhibits, in the Love Family Atrium, include, to name just a few, Fraggle Rock, The Dark Crystal, and Labyrinth, starring David Bowie. Speaking of celebrities, I had the distinct pleasure of meeting Ben Browder this year at Dragon*Con. Browder was the star of Farscape, a science-fiction television show featuring a significant amount of puppetry. Creating convincing characters in the form of puppets for a high-action, drama sci-fi series was a challenge—especially for demanding sci-fi enthusiasts, such as myself. That challenge was met with success, especially with Rygell XVI, a vertically challenged alien (puppet) of royal lineage frequntly performing from a floating throne. The Center for Puppetry Arts is not only for kids. There are grown-up-only exhibits and teen and adult performances, too. One of the racier puppets on display is the renowned "Madame" who was performed by Wayland Flowers. The word on the street is that Madame has been resurrected and is now performing, via a new puppeteer, in New Jersey. OK, back to the beginning of the guided tour. I had the pleasure of an individual tour given by a delightful and obviously puppetry-savvy young lady who was professional, enthusiastic and in-tune with her tourists. We started in the museum exhibit "Puppets: The Power of Wonder" where she explained what constitutes a puppet, which is a lot more than I knew. The first puppet on display is a "phoenix" made of found objects. Activated by the push of a button, it's a large automated puppet complete with lights and sound. I made the comment that "the phoenix is appropriate for Atlanta." The Phoenix sometimes symbolizes Atlanta as it too arose from the ashes, paralleling Atlanta's rise from the ashes following the Civil War. She looked at me quizzically and told me that I was the first to make the connection between the phoenix being at the beginning of the tour and the City of Atlanta. My sense of pride in having made the connection was soon to be dashed as questions to test my true intellect where posed throughout the tour…Let's just say that it was indeed a learning experience. "…to entertain and enlighten audiences, nurture the world community of artists, expand the puppetry art form, and explore the past, present, and future of puppetry." To meet that end, offerings include workshops, tours, field trips, performances, film series, outreach programs, a puppet factory and distance learning…certainly more than I can discuss here. If you have even a mild interest in puppets of any kind, this tour is one you will find intriguing and exciting…it's a door to a whole new world of imagination and artistry. I've long admired puppets, many of whom were childhood friends from television and theatre. Today, I gained a new appreciation for puppetry—the art form. It has seemingly been a lifetime since I was so impressed, so awakened by any form of art…this is, by far, one of Atlanta's best entertainment and educational destinations. The Center for Puppetry Arts has an incredibly full calendar of performances—for children, families, adults and holiday specific. The information shared in this post is primarily about the museum. Please refer to the Center's website for information about performances and special events. At the museum and theatrical performances, photography, videography and even texting is strictly prohibited. Why? I didn't even have to ask…my tour guide clearly and succinctly explained that the puppets and performances are copyrighted. So the rule is not only protection for them, the rule also serves as protection for visitors. The Center for Puppetry Arts will not have to pull my strings to get me back. I will be returning later this month for a major production of "Rudolph the Red-Nosed Reindeer," based on the 1964 television classic performed by dozens of "live" puppets! Hours: Tuesdays-Friday 9 a.m. – 3 p.m.; Saturday 9 a.m. – 5 p.m.; Sunday 11 a.m. – 5 p.m., Mondays – Closed.